Sourdough bread has been a staple of dinner tables and around campfires for many years. This bread has a long fermentation process that uses naturally occurring yeasts and lactobacilli. Before commercial yeasts there weren’t very many options for baking bread. Wild yeasts were “caught” and cultivated (by feeding a flour and water mixture until the natural yeast begins to reproduce) and bread was then baked using this yeast product. Sourdough became a very popular bread and likely got its name from the mildly sour taste it had because of the lactic acid produced by the lactobacilli. Making sourdough bread in the traditional manner takes longer than modern versions but is something you can take pride in and make completely from scratch with easily sourced ingredients. Making sourdough doesn’t take any fancy equipment or machines. Mixing up your dough is easy. After sitting the required amount of time, just slip it in the oven and you’ll have fresh loaves of bread before you know it. 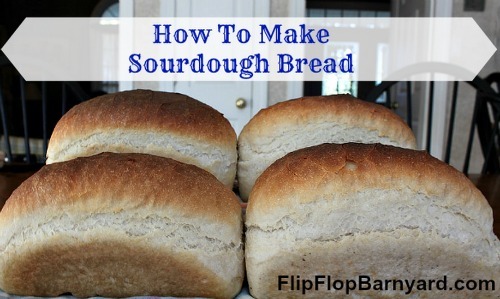 This is a great alternative for someone who is tired of store bought or commercially made breads and the bread can be made relatively inexpensively in just a few days time. Since eating bread has been a staple of human diet since we learned to bake it, many people have variants that have been passed down through their families. This is one of the reasons why we were so happy to find a wonderfully clear recipe that seems to capture the basics of how to create a delicious sourdough bread. The tutorial we discovered adds a rich bit of history to the process and includes a fantastic recipe and guide to help you through the process. Making and baking bread is a great activity for family and friends (or anyone) that enjoy baking and making food from scratch. Baking your own bread brings a satisfaction that buying it from the store just won’t give you. Making it with non-commercial yeasts provides you with a guarantee that you know exactly what you’re putting into family’s bodies.